As Summer approaches we're starting to plan for outdoor dining, and lanterns are perfect lighting. I love candle light at dinner, and lanterns protect them from the wind, and look fabulous as well! 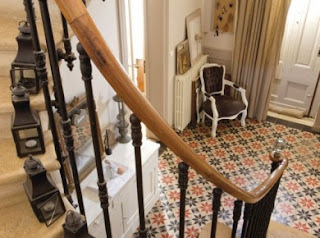 When not in use outdoors, why not line a staircase with your lanterns like this one in the French magazine Art et Decoration. Multiples are always better! 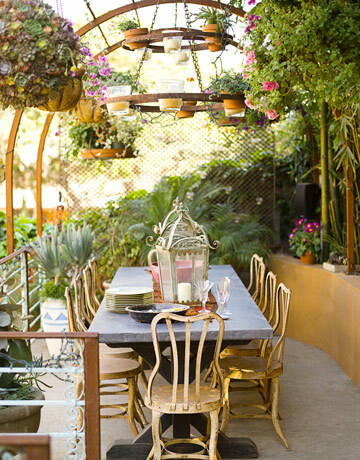 Or one beautiful big lantern like this one above set on the table adds decoration as well as light. 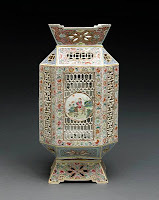 There are, of course, lots of sources for lanterns, but auctions can either afford the unusual, or good value, or both! Starting with great value, this group of six Moroccan pierced tin lanterns sold at Christie's in New York for $313! Bargain, and lots of fun. 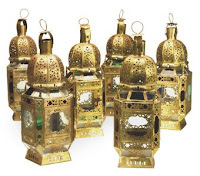 This is actually a group of ten lanterns which sold at Christie's for $813. 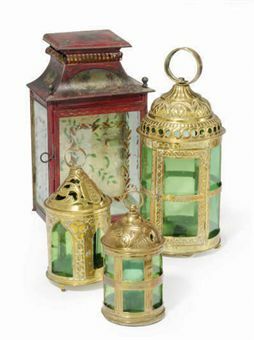 This grouping of four 19th century lanterns sold for $938 at Christie's. I particularly like the tole painted lantern in the back, but they all look great. The various sizes and styles make for an interesting mix in your outdoor room. 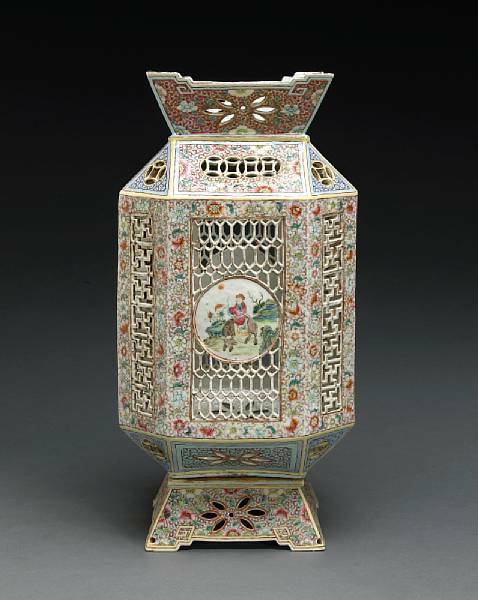 For something more of an investment piece, this lovely Chinese porcelain (Republic Period) lantern is just beautiful. It sold at a Bonhams auction for $2,440. 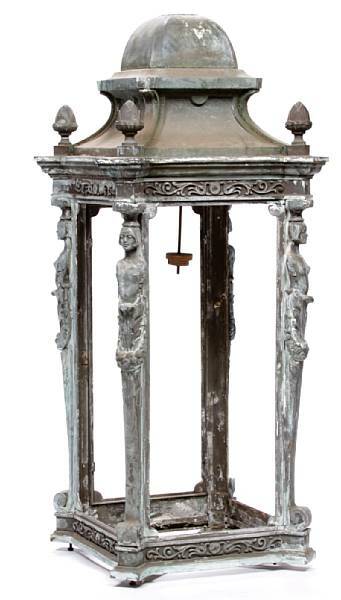 This very chic patinated metal lantern has a stand, and has an overall height of 76". This would be an imposing piece on a patio of porch. This sold at a Bonhams auction for $1,098. This modern Art Nouveau style lantern caught my eye. 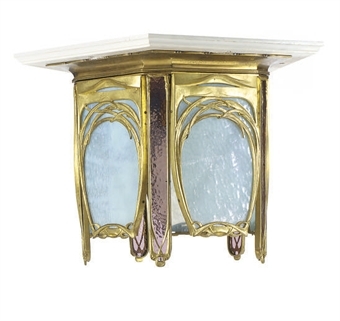 It's quite decorative, and the colored glass would cast a warm candle lit glow. This sold at a Christie's auction for $1,188. Candles add romantic lighting to your al fresco dining, and lanterns are both a practical and beautiful way to keep the flame from blowing out. 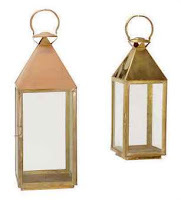 Add a single special lantern, or multiples to light a path or the edges of the patio. Modern details - decorative and practical too!